Cats 1 year of age or older can be can be adopted for just $25—a savings of $55! Kittens younger than a year can be adopted for $25 off the regular adoption fee! Free raffle entry into one of Lollypop Farm's many giveaways! Beshu II is a 2-year-old female cat. She is quite petite, weighing just over 6 pounds. 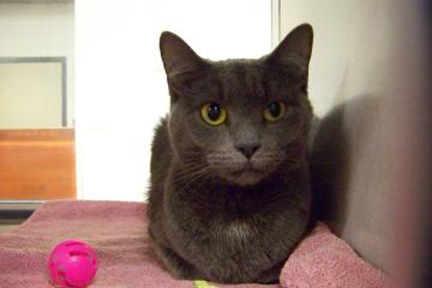 She has a gorgeous grey coat and is super friendly. She loves to stay busy! First, she’ll check out what’s happening out the window. Next, she’ll see if any closets or cupboards need looking into. And then there are her naps – she can’t be late for those! And, since June is Adopt-A-Cat Month at Lollypop Farm, Beshu II can become a member of your family for just $25! Come meet this sweetie today! That cat totally looks like our cat! Too funny! I hope she goes to a great home!